A blog post featuring a California farmer and specially selected wheat varieties has been a long time coming. I’m really pleased that this first dedicated post involves collaboration with Mai Nguyen, who farms in Sonoma County, CA. There are many things about Mai that make her special to me, most notably: she’s a young, female farmer growing heritage wheat – it’s a trifecta of specialness! But, there’s much more to her than that. In truth, what bonds us in this topsy turvy world of reinventing regional grain systems is her ability to see the bigger picture and her willingness to make farming choices that are centered on ethics and sustainability rather than industrial norms. 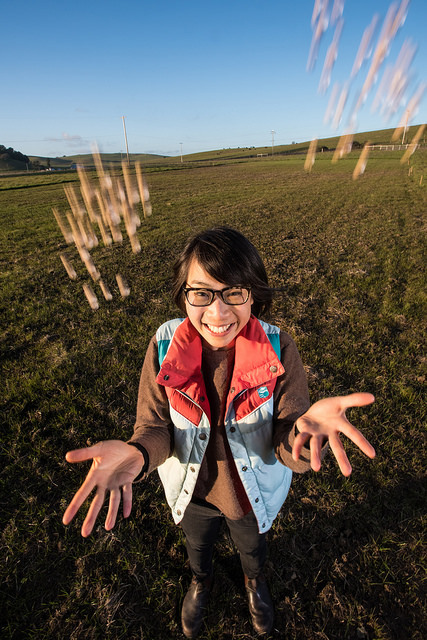 We need more young farmers like Mai! She is meticulous in her seed selection and farming practices and it shows in every kernel of grain harvested. Many more talented writers than I have done profile pieces on Mai. Some of her favorites are posted on her website, which you can scroll through and read at the bottom of this link: http://farmermai.com/farmer/. I hope this post peaks your interest enough to click on the links and get to know here a little better. If you are interested in buying wheat berries, please go to Mai’s website and purchase directly from her. I am all about the beautiful flour, but I understand I haven’t converted absolutely everyone just yet. And if the flour isn’t your priority, then I’m in favor of the farmer making the full profit margin off of her crop. Wit Wolkering is actually related to our beloved Sonora, but it was originally planted and grown in South Africa. Wit has a warm, mellow, buttery flavor. I encourage you to bake just about anything with it, because its creamy color and flavor are pretty magical and have the power to convince whole grain haters not to hate. I was so in love with the sourdough bread that I made with Wit Wolkering, and so impressed with the crumb, that I made it another 3 times in a row just to prove it wasn’t a fluke. I thought that meant making a sandwich loaf with commercial yeast would be a no brainer, but the flour showed some fermentation intolerance during the second rise, cracking and breaking on the surface. Phone calls to baker friends for help and many trials later, we developed an easy method using a preferment that solves the issues and yields a perfect, delicious loaf. In a medium bowl, mix together the water, flour and yeast for the poolish. Cover with plastic wrap and leave out at room temperature for 12-14 hours. Preheat oven to 350 and toast cornmeal just until lightly golden and starting to become fragrant, about 6-8 minutes. Either in the microwave or on the stove top, gently warm the buttermilk, honey and butter, just until butter begins to melt. Do not let it get hotter than just warm to the touch, otherwise let it cool a little before adding the yeast. Add yeast, whisk to combine and let sit for about 10 minutes to get foamy and active. In the bowl of a stand mixer fitted with the dough hook, put flour and salt. Add buttermilk mixture and poolish and mix on low to bring dough together. Raise speed to medium and mix for 5 minutes. If dough is too wet, add flour 1 Tbsp at a time, but do not add too much: the dough should be on the stickier side, when the right texture it will clear the sides of the bowl, but leave a film and will still be sticking to the bottom. Transfer to an oiled bowl, cover with plastic wrap and let proof until doubled in size, about 1 hour. Remove dough to a very lightly floured work surface. Shape loaf by patting dough into a rectangle no wider than your bread pan. Roll up the dough jellyroll style, pinch to seal seam and place in pan seam side down. Cover loosely with plastic wrap or a lint free towel and let rise again until dough begins to dome over the edge of the bread pan, about 45 min to 1 hour. During the last 30 minutes of your final proof, preheat oven to 375˚F. If using egg wash, brush top of loaf (it looks really pretty with the shine!). Bake 30-45 minutes until nicely browned and the loaf sounds hollow when when tapped on the bottom. Temperature should read around 190. Chiddam Blanc de Mars was first grown in England, but really gained in reputation when France began growing it at the end of the 19th century. Those highly particular French bakers loved this wheat for their prized baguettes. We found its flavor to be bright and reflective of its nature: grassy, with notes of fresh herbs and sweet hay. We haven’t developed a baguette recipe yet, but it’s in the works. In the meantime, I love this flour for everything from scones to sourdough bread, and particularly for these sticky buns. 1. Mix warm milk with honey and sugar. Add yeast, stir to mix. Let stand for 5-10 minutes until yeast has bloomed. 3. In the bowl of a stand mixer fitted with the dough hook, combine flour, salt, yeast mixture, butter and egg. Mix on low to incorporate all ingredients, then raise speed to medium high and mix for 4-5 minutes. The dough will remain very loose and sticky, not cleaning the sides of the bowl. Stop and scrape down a couple of times to encourage the dough to come together, but resist the temptation to add a lot of extra flour. You can add 3-4 tbsp if it just seems too wet, but again this will not look like a traditional dough. Place dough in a bowl coated with nonstick spray, cover tightly with plastic wrap and let rise for 1-1 ½ hours or until doubled in size. 4. In a small saucepan, combine all ingredients. Heat until butter has melted, bringing just to a low simmer. Stir just a minute or two until most of the sugar granules have dissolved. Remove from heat, stir in fleur de sel. Pour into a 10-in round cake pan or 8×8 square baking pan. Set aside. 5. In a small bowl, combine brown sugar, cinnamon and orange zest if using. Melt butter in a separate bowl. 6. Turn dough onto a very lightly floured work surface. Roll to a 16×12 inch rectangle. Brush melted butter over surface then sprinkle on brown sugar mixture. Use your hands or a rolling pin to press brown sugar into dough. Roll up tightly and cut into 9 equal pieces. Arrange rolls, spacing evenly apart in baking pan. Cover with plastic wrap and let rise until puffy and rolls begin to touch one another, about 45 min to 1 hour. 7. Preheat oven to 350. Bake rolls until golden brown, about 20 minutes. Immediately turn out onto a sheet of parchment or platter, scraping any remaining caramel from the pan onto the rolls.